Cities are the anchors of human civilization. By 2050, roughly three quarters of humanity will live in one. While offering extraordinary opportunities for prosperity, creativity and wellbeing, cities of tomorrow will also confront monumental challenges associated with poverty, inequality and fragility. Decisions made by urban leaders in the next decade will determine the livability – even the survival – of cities across the planet. One factor uniting cities is that all of them will suffer the effects of climate change. 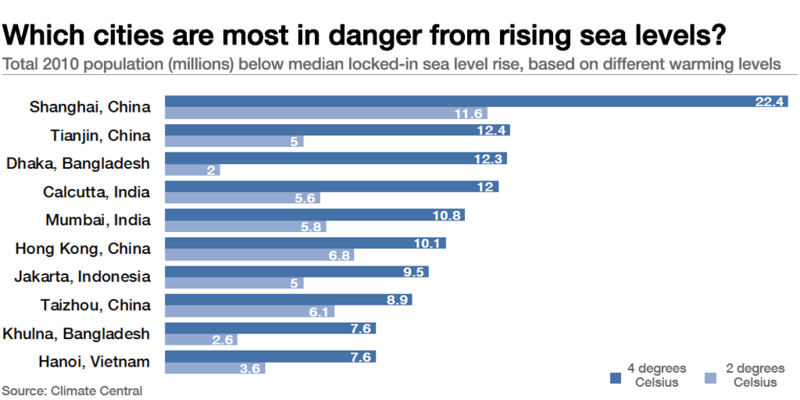 Most will experience rising levels of flood exposure, water shortages, storms and heat stress. The severity of risk will be mediated by their location – whether on the littoral or inland – but also the extent of their preparedness. Governments, businesses and civil society groups have an opportunity now to design-in resilience to our cities, but no city is immune to the coming storm. In fact, most cities are already on the front-line of climate change. At least 70% of them are currently dealing with sudden onset disasters and long-term environmental stress. They are confronting a host of related challenges ranging from health pandemics to population displacement. The massive concentration of people in cities over the coming decades – especially in Africa and Asia – will almost certainly exacerbate traffic congestion, worsen air quality and increase amounts of waste. What makes cities so vulnerable? Geography certainly plays a role. More than half of the world’s population lives within 60 kilometres from the sea. At least three quarters of all large cities are coastal. Most of them are already exposed to flooding even with nominal rises in sea level or storm surges. But the future looks much worse. Climate Central has projected the impacts of temperature increases of between 1.5-4°C for 266 coastal cities over the next few decades. The forecast is dire. Cities like Buenos Aires will see between 520,000 and 2,440,000 people – 4 to 9% of the urban population - below the locked-in sea level rise. In other cities like Chittagong, the numbers are higher: 1.8 and 6.9 million people. Some cities will disappear altogether. China's Nantong will see between 1.7 and 6.4 million people displaced – from 27 to 99% of the population. Between 80 and 98% of the residents of Amsterdam and The Hague will be underwater depending on the extent of global temperature increase. It does not take much imagination to picture the disruption and costs this water rise will generate. Cities are also part of the problem. While covering just 2.6% of the world’s surface area, they account for over 50% of the world’s population and 70% of all CO2 emissions. They are also responsible for a disproportionate amount of greenhouse gas emissions. What’s more, they also consume over two thirds of the world’s energy supply. The burning of fossil fuels and cement production are considered the chief culprits. Climate scientists are busily modeling the combined effects of these emissions, and the prognosis isn't looking good. Yet cities are a key part of any solution to preventing climate change and mitigating its effects. Measures undertaken in cities can meaningfully offset carbon emissions while also improving the quality of life for residents. And unlike slower moving nation states, cities are laboratories of innovation and experimentation. Cities could start by developing clear action plans. Most cities in Latin America, Africa and Asia grew at breakneck speed. Unable to keep pace with population growth, they have succumbed to urban sprawl and resource-intensive energy use. But exactly the opposite approach to urbanization is required. And inspiration for such an approach likely does not come from North America (or even Europe) given the extent of urban sprawl and unsustainable resource use. The New Climate Economy Project has shown how urban density and compact cities can lower the carbon footprint. But cities don't necessarily spontaneously gravitate in this direction. What is needed is appropriate planning legislation to incentivize dense development. Building codes should support vertical growth and connected infrastructure – especially smart public transport. Tax incentives and subsidies should support greener growth, including renewable energy sources such as wind, solar and biofuels. All of these investments have the added advantage of making cities more liveable and attracting human capital. Also critical to building more resilient cities is progressive municipal governance. As democratic theorists have noted, municipal leaders are frequently more accountable to their constituents than their national counterparts. Public finance reform can help empower cities to take the necessary steps to plan for climate change, including stimulating private financing for smarter urban infrastructure, low carbon programmes (e.g. recycling, congestion pricing), and investment in new technologies such as bio-engineering and carbon sequestration. Cities simply cannot afford to delay action. There is a real risk that the fastest-growing cities adopt outdated planning models that lead to resource-intensive plans and infrastructure. The good news is that some cities are exploring new forms of collaboration to accelerate climate action. The C40 is a prime example of inter-city collective action with over 10,000 climate change actions since its founding. Other groups like the ICLEI, UCLG, and Global Parliament of Mayors are also forcing change from the bottom-up. Ultimately, the future of climate change resides in decisions taken by cities in areas with the most rapidly growing economies and population. They face unenviably hard choices. Investments in dirty energy – coal, for example - may generate short-term returns but could also yield devastating long-term consequences. It may be cheap, but it locks in climate effects with implications for mortality and morbidity. The WHO estimates that 1 in 9 deaths around the world is due to pollution. What’s more, the costs of pollution to citizens in OECD countries, China and India amounts to $3.5 trillion a year. Some of the world’s more prosperous cities are already turning things around. Cities that have grown denser, reduced congestion, and introduced enlightened urban planning have both decarbonized while attracting mobile and highly skilled workers. Cities like Stockholm and Copenhagen have reduced their emissions by between 35-40% while seeing their economies grow by between 40-50%. After years of poor performance, city leaders from Hong Kong and Seoul to Los Angeles and New York are also following suit. The real measure of success is when enlightened leaders from the fastest growing cities start setting the pace.